Thank you for your input into the detailed design survey. Please see the results and report now available in the Document Library. 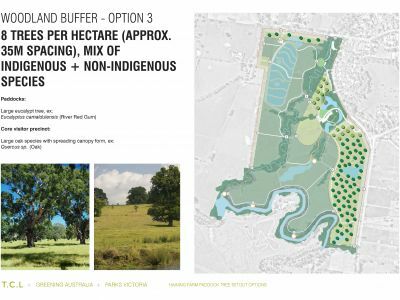 Following the release of the Haining Farm Concept Plan by DELWP and Parks Victoria in September 2017, implementation to transform this dairy farm into a public park, with habitat for endangered native species, has commenced. Earthworks, revegetation and bushfire mitigation works are all underway. The details and outcomes of the earlier stages are provided on the ‘Background’ tab. The planning for the wider area of the Yellingbo Conservation Area is available here. Read about a Community Planting Session scheduled for Tuesday 9th April and find out how to participate! 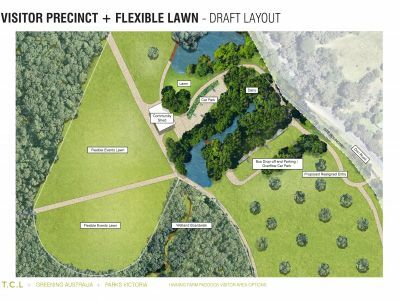 This project is now at the detailed design stage for the visitor precincts, and work has started in the conservation areas to shape the landscape in preparation for revegetation and to implement the bushfire mitigation measures. These components of the plan are funded with works planned for later in 2018. Community and stakeholder input into the design of the future visitor areas is an important step in creating the best possible park. This will assist in developing future funding bids to implement the full potential of Haining Farm. The woodland buffer area of the park retains the visual amenity of the paddocks along Don Road and Dalry Road, with pasture in between the spaced trees for possible future agricultural uses. 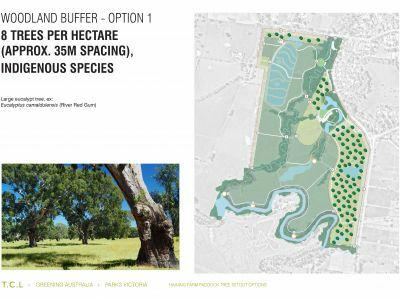 The open woodland buffer will be an effective measure to reduce wind speeds and so lessen the bushfire risk of the site following revegetation. The design for spacing of 35 metres between the trees was recommended by fire experts as being the best to reduce wind speeds through the buffer. Several tree species were recommended as suitable because of their shape, size, growth rate, bark type and as they have a link to the history of the area. We are seeking feedback on three options. The woodland buffer is funded as part of the bushfire mitigation measures. Two visitor areas are proposed, with layout plans drafted for community input. 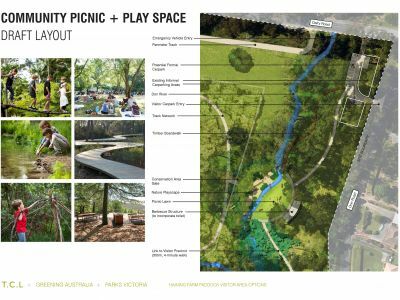 The ‘Community Picnic and Play Space’ at the corner of Don Road and Dalry Road would provide a picnic lawn with a shelter and barbecues as well as a nature play space for interaction with the Don River landscape. 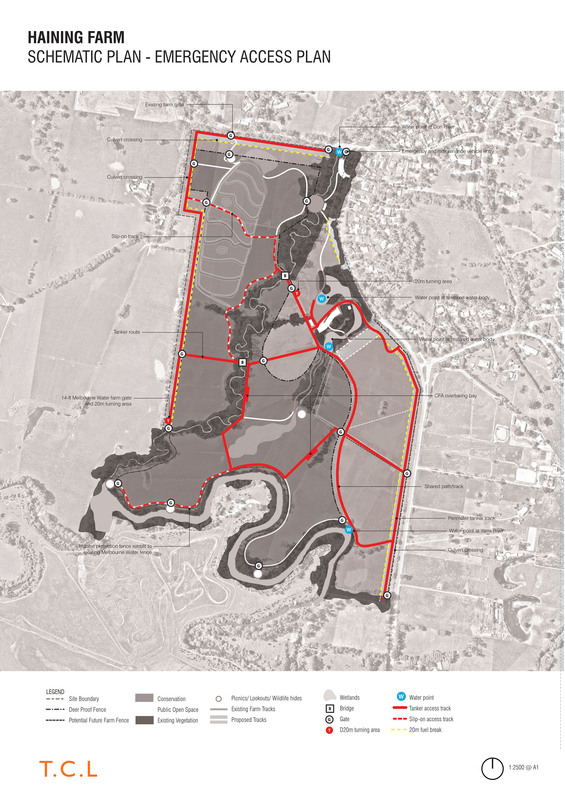 This will link to the future conservation area walking trails and the main visitor precinct. The ‘Visitor Precinct’ celebrates the agricultural heritage of Haining Farm through re-use of the former dairy. 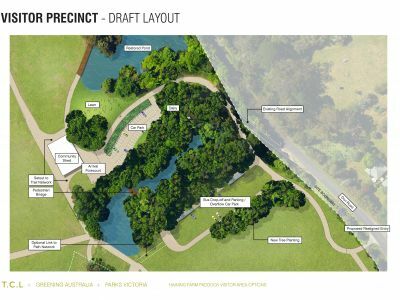 Set within a network of restored ponds, established trees and informal lawn spaces, it provides space for recreation, education, events, markets, and interpretation. 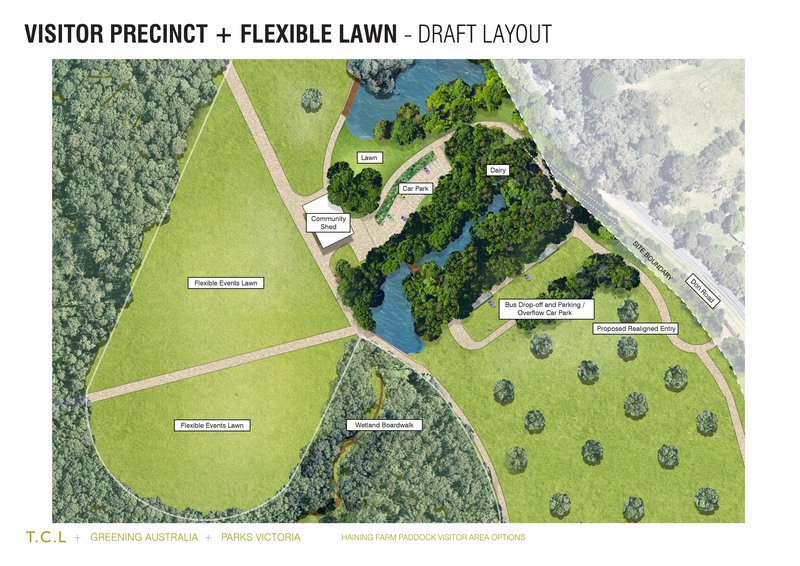 An event space with a ‘Flexible Lawn’ area is also proposed near the visitor precinct. These components are currently unfunded. Future funding requirements will be informed by public feedback about the suggested designs, and implementation of the proposed elements for the visitor precincts will depend on securing funding. We are interested in the activities and uses that you would like to undertake in the park and how the community would like to be involved. In the future the park will provide for visitor activities and also continue education opportunities that have been long associated with Haining Farm. This survey will take approximately 5-10 minutes to complete and has been extended to remain open until 28 September 2018. Parks Victoria is committed to protecting personal information provided by you in accordance with the principles of the Victorian privacy laws. We are also committed to the government policy of openness, accountability and transparency. The information you provide will be made available to the Parks Victoria/DELWP Haining Farm Project Team to help inform the future planning for Haining Farm. Personal details (name/contact details) will not be made public at any time. We are investigating three suitable tree planting options for the woodland buffer area of the park. We are looking for feedback on the types of tree species to be used; native, exotic or a combination of both. Which of the woodland buffer options do you like the best, and which species would you prefer? What visitor facilities would you like to see included in this area? What features would you like to see in the design of the play space? Located at the former dairy and farm buildings. Based on previous feedback from the concept planning process, we have incorporated a number of elements in this area. Do you have any ideas or other suggestions? What possible uses would you like to see for the event space, flexible lawn area and community shed? What kinds of activities would you like to see available in the park? Volunteering is an important part of the community vision for Haining Farm. What type of activities would you like to be involved with? Are there any other comments about the detailed design of Haining Farm that you would like to pass onto the project team? The Victorian Government has committed $670,000 to implement bushfire mitigation measures at Haining farm, in addition to an ongoing $50,000 per annum maintenance commitment. The funding will be used to establish a number of measures that will ensure fire risk is minimised to the site, including: a 20m fuel break around the area boundary; an internal track network to make the site easily accessible to emergency response vehicles; additional water points, and; an open woodland buffer. 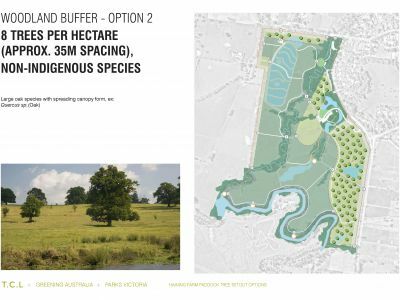 Haining Farm presents an opportunity to create a new public park, focussing on the protection of two important threatened species the Helmeted Honeyeater and lowland Leadbeater’s Possum. Following the Victorian Environment Assessment Council (VEAC) investigation of the values contained on the public land within the Yellingbo Investigation Area of which Haining Farm lies, VEAC recommended in 2013 that Haining Farm become a community use area and as a prime opportunity for revegetation with floodplain forest habitat to support threatened species. 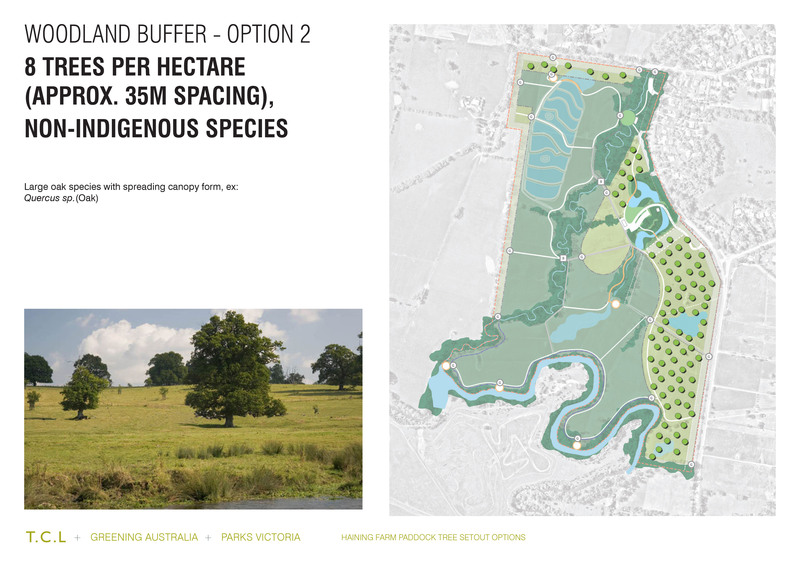 In response to this, Parks Victoria has been working with DELWP, Zoos Victoria, Greening Australia and the Yellingbo Conservation Area Coordinating Committee (YCACC) to plan the future for Haining Farm. During 2016 and 2017, significant community and stakeholder conversations were undertaken by DELWP to determine an appropriate plan for Haining Farm. These conversations focussed on factors including bushfire risk, hydrology and habitat, and were supported by technical investigations by relevant experts. From this process a concept plan was prepared and approved. The stages of the project are shown in the figure below. After several months of work and significant community engagement led by the Haining Farm Working Group, the final concept plan for Haining farm was released in September 2017. Thank you to the Haining Farm Working Group for their efforts and time in investigating the options and providing their recommendations, and the broader community for sharing their feedback and helping shape the future use of the site. The concept plan attempts to balance the importance of conservation to the Victorian community, with the views of the local community and considerations to prevent increased bushfire risk. It was developed based on a combination of the recommendations of the Working Group, an assessment of bushfire risk and the results of extensive community consultation. 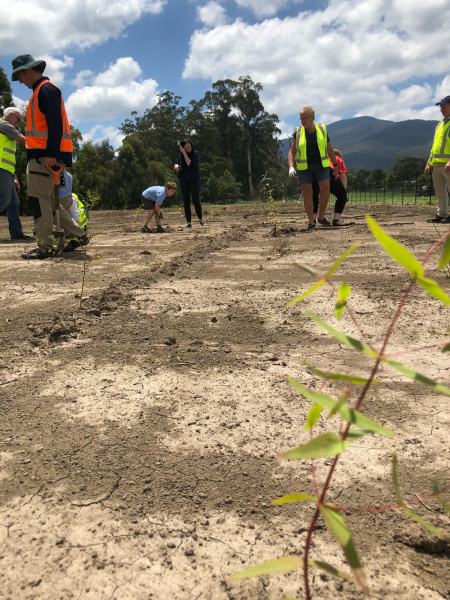 Community consultation recorded a significant level of support for the site to be used for conservation purposes and provide habitat for the Helmeted Honeyeater and Lowland Leadbeaters Possum at Haining Farm. To achieve this, the concept plan must include sufficient habitat including wet environments and dense mid-story vegetation as required by these species. The presence of farm animals, particularly along the northern and southern boundaries, is evidently important to the local community and future uses for these areas that are consistent with these views will be investigated. 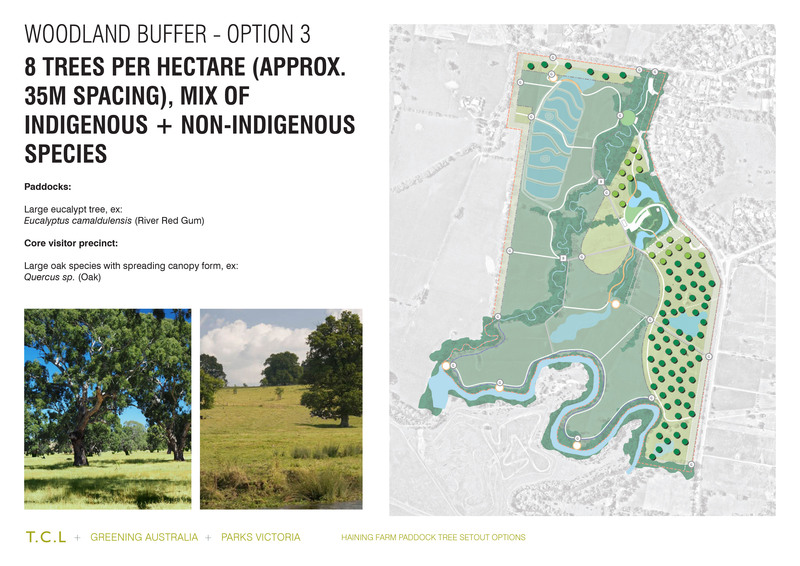 The final plan for the site includes open woodland on the northern and eastern boundaries, which is considered essential to prevent an increase in bushfire risk and in response to community concerns additional water sources will be incorporated in these areas. Collaboration with the Country Fire Authority in the detailed design phase will also ensure that the site meets their requirements for bushfire response. 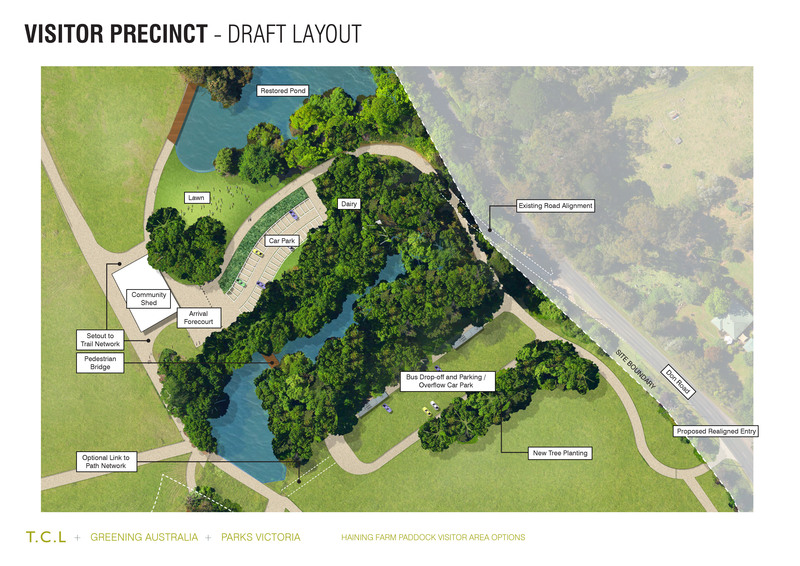 Improved community access, recreation and education opportunities were important to both the local and wider Victorian community and these are integrated in the final concept plan to ensure the site responds to the wishes of Sir John Reid when he donated the land to the Victorian people as an environmental study park. 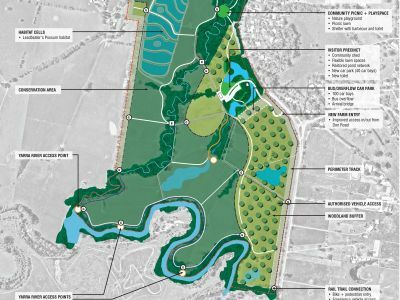 At meeting number 12, held on 27 July 2017 it was decided that the Don Valley Community Representatives would prepare a narrative to provide the background to their recommended concept plan, which would be provided to the joint sponsors of the Working Group. The process behind the Working Group’s recommendations and the associated narrative has involved 13 formal meetings and many informal meetings held by the community members to consider and evaluate the information and reports provided by the various government departments. The community members of the Working Group considered the importance of farming to the local community, including the connection to seeing cows on site, the perceived bushfire safety provided by open pasture, a petition undertaken by the Yarra Waterways Group and the clear difference of opinion between the views of the local community and the wider Victorian community who preferred the site to be used for conservation purposes. The concept plan proposed by the community members of the Working Group split the site 50/50 to provide conservation along the waterways and retaining sufficient pasture in the remaining areas to maintain a dairy operation onsite. The values adding concept proposed by concept 2 has also been dropped as part of the groups proposed compromise. Increased community access is provided for to allow the public to walk through and view the farm animals in pasture areas and threatened species in the areas set aside for conservation. The tracks would also improve access for fire management. The Working Group community members think the proposal considers the wishes of the donor of the Haining Farm, Sir John Reid, and that the donor should be recognised for his gifting of the farm, and subsequent contribution to the modernisation of the dairy, with a plaque to be placed in a secure, publicly accessible area onsite. The proposal also provides an opportunity to educate children on farming and conservation and how they can coexist. Agency and partner implementation working group. 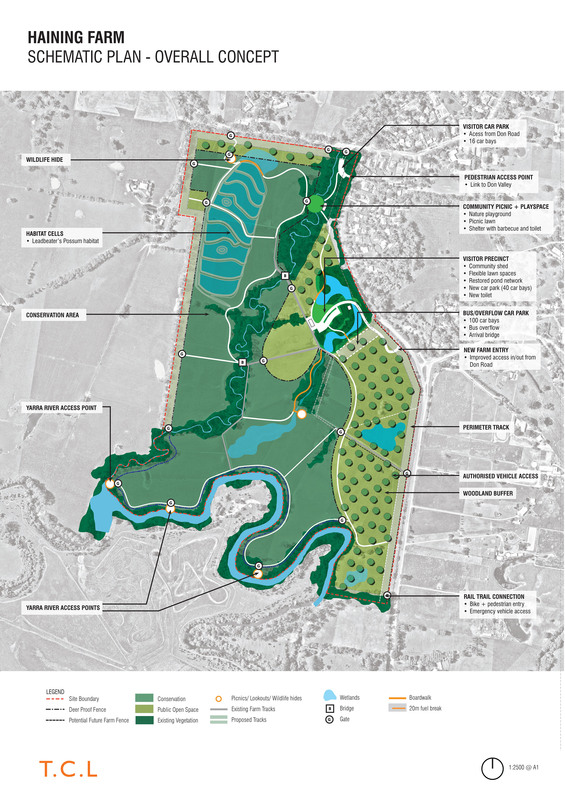 Detailed design of the bushfire mitigation measures, habitat restoration, community parkland facility. 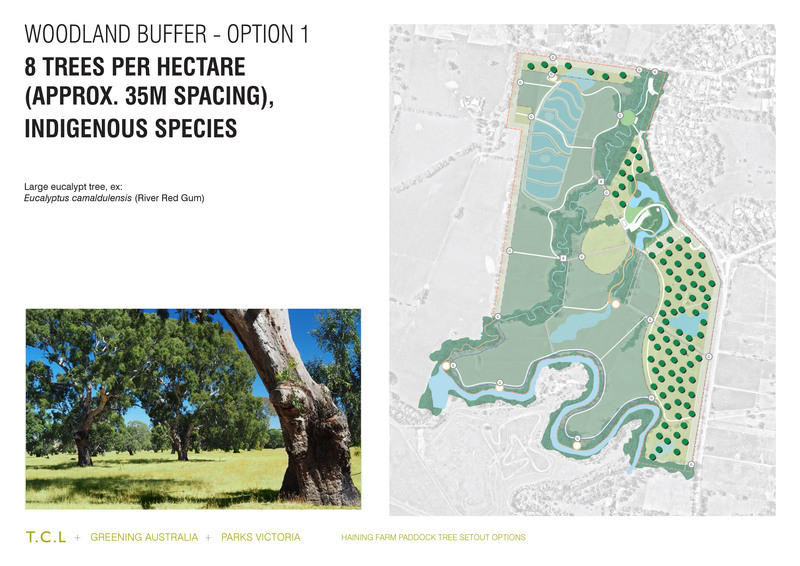 Community input to woodland buffer species, future visitor precincts, uses and activities. Agency, partner and community implementation working group. Establishment: earthworks for revegetation, site clean-up, fencing, revegetation, woodland buffer. Pursue opportunities for community access, education, volunteer and community activity. Land management and maintenance across all the park. 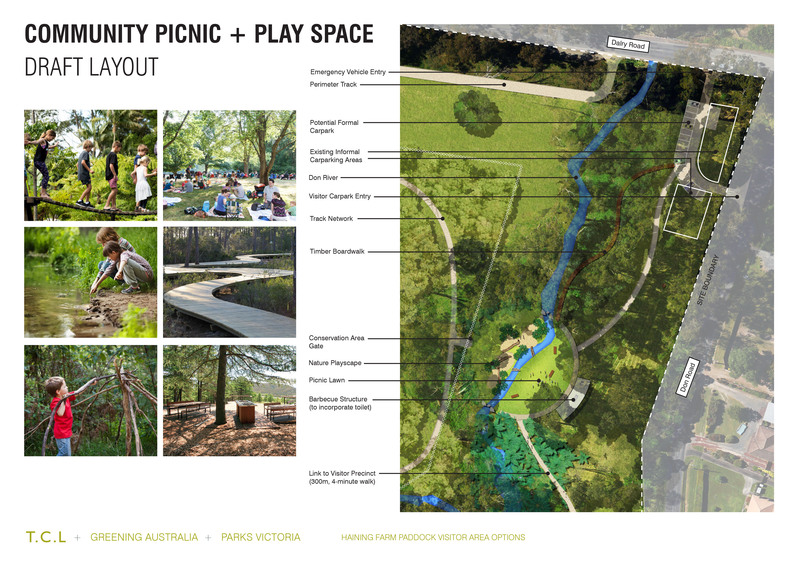 Seek funding to develop the Community Picnic and Play Space. Community, education and commercial activities contribute to the vision for environmental, social, heritage and farming history values. Seek funding to develop and activate the main Visitor Precinct. A schematic of the precinct scheme, uploaded April 2018. 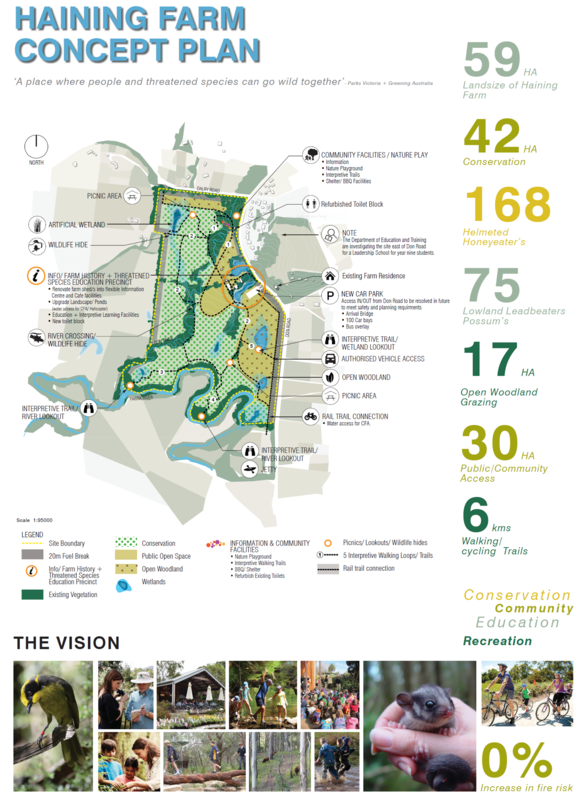 An update from Parks Victoria including information on community play spaces, site clean-up works, deer-proof fencing, and the artificial wetland. Detailed image showing key features of redevelopment, including location of: pedestrian access points, visitor car park, new farm entry and more. Community newsletter on Parks Victoria commencing development of a detailed design plan for Haining Farm. Word document of survey questions. PDF of map showing how the area could be used to benefit conservation values. PDF of map showing how the area could be utilised by industry. PDF of map showing how the area could be used to benefit tourism. PDF of map showing threats and issues in the Yellingbo area.